For 17 years, ending in 1999, Iron Crown Enterprises (ICE), held rights to produce games based on the world created by J.R.R. Tolkien. 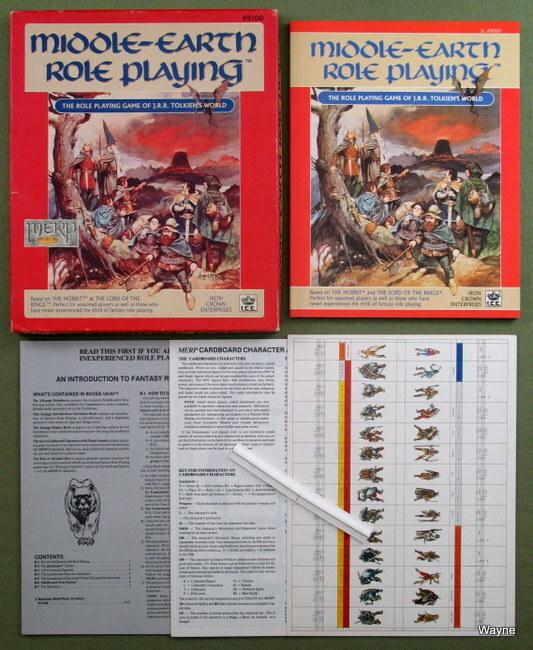 ICE released over 100 sets and sourcebooks detailing the penultimate fantasy campaign world, regarded in gaming circles as the cream of the RPG genre. 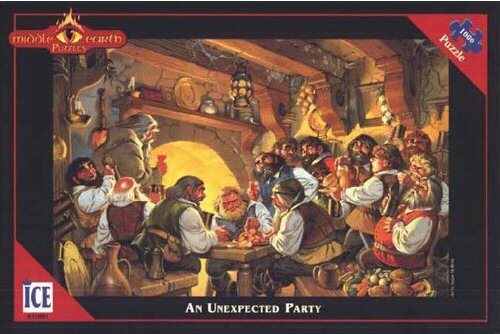 Known writers Peter Fenlon and Terry Amthor were joined by talented artists Angus McBride and Liz Danforth (as well as the contributions of countless others) to open Middle Earth to game players. With the imminent arrival of the Lord of the Rings movie trilogy by Peter Jackson, ICE surrendered the license to MERP. "The movies are why ICE went under. We had always been self funded from sales and receipts, and had worked with Tolkien Enterprises when we had seasonal cash flow problems. But when the movies were scheduled, the called in all of the money due when we hit the next shortage. Then they licensed dozens of other companies to do what we had been doing." A complete character development systems covering Hobbits, Elves, Dwarves, etc. material covering poisons, healing, weather, magic items, MIDDLE-EARTH creatures, encounters and much more." 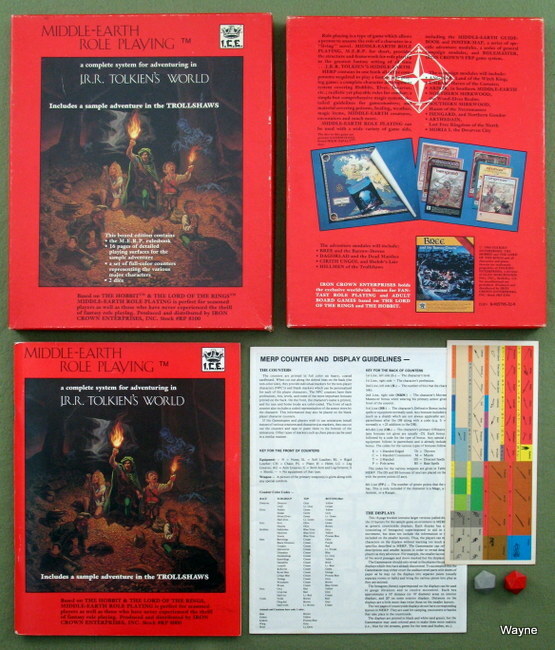 * 1st edition MERP rulebook (red cover, shows characters in treasure hoard menaced by ghosts). * 16 page booklet with floorplans. * Card with character counters. 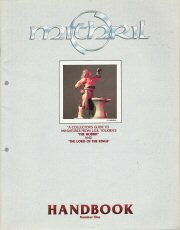 * An adventure booklet including a solo adventure and a beginning multi-player adventure with layouts. * A layout and chart booklet with layouts for the Trollshaws adventure. * 56 full-color stand-up playing pieces of all the adventure characters. 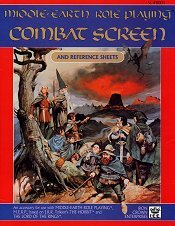 4 panel screen & two 11x17" combat charts. "In a role playing game, you assume the role of a character in a "living" novel. 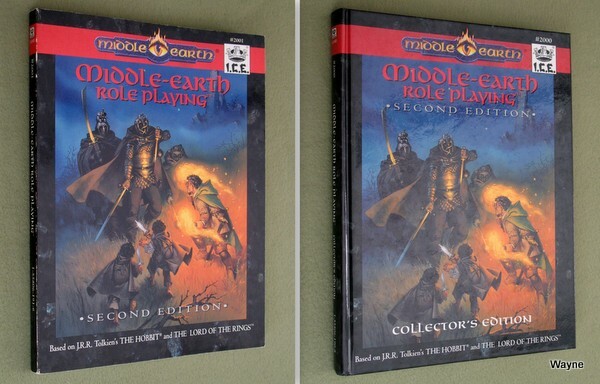 Middle-earth Role Playing (MERP) and its companion sourcebooks provide the structure and frame work for role playing in the greatest fantasy setting of all time... J.R.R. Tolkien's Middle-earth. Middle-earth Role Playing is the next step up for those who have already experienced the thrill of ICE's introductory role playing game, the Lord of the Rings Adventure Game. It is also perfect for more experienced gamers who are looking for a realistic, easy-to-play fantasy role playing game. • Middle-earth Character Templates for those who want interesting, fully developed characters in a flash. • A complete Character Development System covering Hobbits, Elves, Dwarves, Humans, Orcs, Trolls, etc. • A Magic System with simple yet comprehensive rules that reflect the unique nature of the use of magic and power in Middle-earth. • A flavorful Combat System that is realistic, fast, and playable. • Gamemaster Guidelines that cover travel, encounters, weather, random events, healing, poisons, magic items, and much more. • Detailed information on Creatures and Peoples that covers the major beasts, monsters, and cultures of Middle-earth. • An expanded set of secondary skills, background options, and professions. • A complete Sample Adventure set in the Trollshaws, complete with layouts." * THE LOONS OF THE LONG FELL, an enthralling adventure in the Trollshaws that introduces MERP novices to Tolkien's world and the wonders of fantasy role playing in Middle-earth. - 6 fully developed characters ready to play and enjoy with no preparation or hassle. - Extensive notes for the Gamemaster to help less experienced GMs learn the subtleties of crafting and running an adventure. - Maps & floorplans of the adventure sites geared specifically for the GM, with information that should initially be concealed from the players. * 60 STAND-UP FIGURES exquisitely rendered in full color. All the people encountered in The Loons of Long Fell are included, as well as the creatures and folk from the sample adventure in the Middle-earth Role Playing rulesbook. 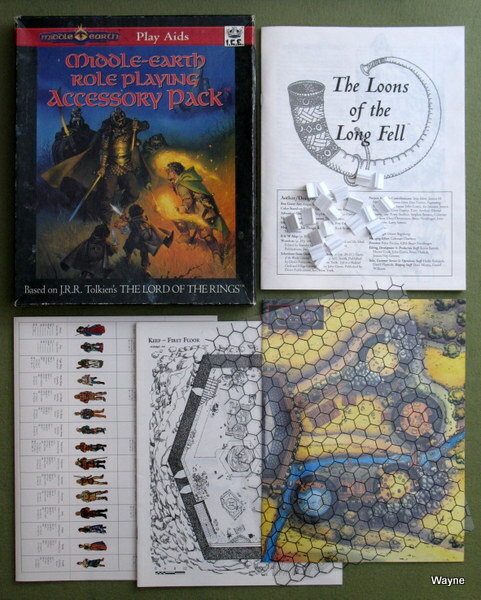 - The Last Inn, Fulcwian's House, & The Long Fell for the adventure in this Accessory Pack. - The Ruined Castle & the Troll's Lair for the scenario in the Middle-earth Role Playing rulesbook." "Inside you'll find the full color poster map of Middle-earth pictured here. It's larger of course, 24" x 36" and rendered in exquisite detail. It includes the region chronicled in J.R.R. Tolkien's The Lord of the Rings as well as the wild lands - north, east, and south! TIMELINE provides in-depth coverage of the entire history of the West. LINGUISTIC guidelines for the many tongues of Middle-earth - the speech of Elves, Dwarves, Ents, Hobbits, and Men. DICTIONARY of Elvish, including notes on pronunciation and grammar. GLOSSARY OF TERMS provides a quick reference for the people, cultures, and places of Middle-earth. 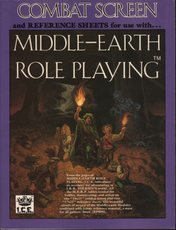 ROLE PLAYING notes for incorporating Middle-earth into any major role playing system. THEME MAPS detail Middle-earth's topography, climate, trade routes, and population centers. 24" x 36" COLOR MAP pictured above - including a superimposed reference grid. The Campaign Guide provides a working base for creative minds who enjoy Tolkien's world - people who have long wished to venture into Middle-earth's lands, experience its magic and politics, discover new cultures, and build upon its wondrous structures and settings. This sourcebook charts the well-documented reaches of northwestern Endor, as well as the shadowy lands that comprise the rest of the continent. Its scope is broad, treating the fundamental and unique themes needed by those who wish to enjoy authentic fantasy role playing in Tolkien's Middle-earth. 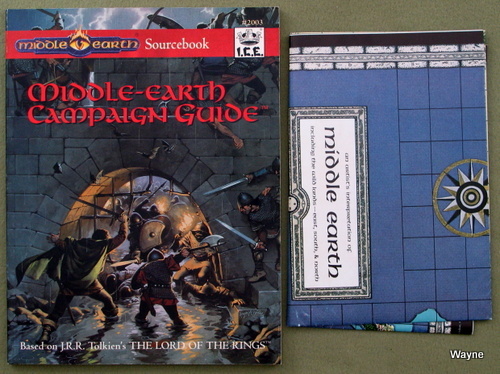 The Middle-earth Campaign Guide is a compilation of material previously available in the Middle-earth Adventure Guidebook, Volumes I and II." 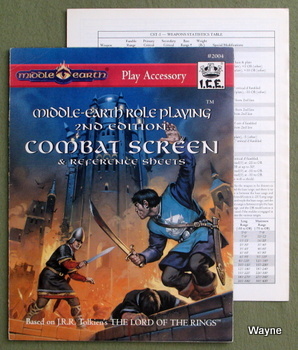 The Middle-earth Role Playing Combat Screen™ is a must for all MERP gamers! Included are all the MERP tables needed for battles, maneuvering, and action. All this on one 34" x 11" combat screen plus two 17" x 11" reference sheets that can double as screen extenders." "Contains 2 full-color maps: (1) ICE's original, 24" x 36" map of Middle-earth, depicting the entire continent of Endor; and (2) a 22" x 34" map focusing exclusively on northwestern Middle-earth. This map of the Northwest is rendered in vivid detail for Tolkien fans who enjoy spotting landmarks passed by the Fellowship of the Ring. Both maps are provided rolled, in poster format: heavy paper, no creases, no grids! Based on J.R.R. 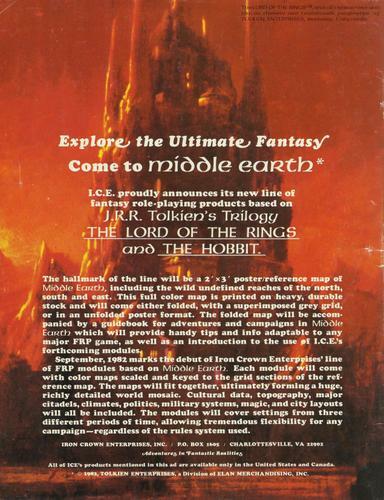 Tolkien's THE LORD OF THE RINGS™"
Explore the Ultimate Fantasy - Come to MIDDLE EARTH - I.C.E. proudly announces its new line of fantasy role-playing products based on J.R.R. Tolkien's Trilogy THE LORD OF THE RINGS and THE HOBBIT. ...from Dragon Magazine, issue 64 (August 1982), back cover. ICE would dominate the back covers of Dragon Magazine for years. "The hallmark of the line will be a 2' x 3' poster/reference map of Middle Earth, including the wild undefined reaches of the north, south and east. This full color map is printed on heavy, durable stock and will come either folded, with a superimposed grey grid, or in an unfolded poster format. The folded map will be accompanied by a guidebook for adventures and campaigns in Middle Earth which will provide handy tips and info adaptable to any major FRP game, as well as an introduction to the use of I.C.E. 's forthcoming modules. September, 1982 marks tile debut of Iron Crown Enterprises' line of FRP modules based on Middle Eanth. Each module will come with color maps scaled and keyed to the grid sections of the reference map. The maps will fit together, ultimately forming a huge, richly detailed world mosaic. Cultural data, topography, major citadels, climates, politics, military systems, magic, and city layouts will all be included. The modules will cover settings from three different periods of time, allowing tremendous flexibility for any campaign — regardless of the rules system used." The Fellowship of the Ring based on the works of J.R.R. Tolkien. "As the Fellowship player maneuver Gandalf, Frodo, Aragorn and the rest of the Fellowship and their allies as they attempt to carry the Ring towards Mordor and its eventual destruction in the Cracks of Doom. As the Enemy player hunt down and crush the pitiful forces of the Fellowship using your minions: Nazgul, Balrogs, Dragons, Giant Spiders, bands of Orcs and Trolls, assassins and other evil servants of Sauron. 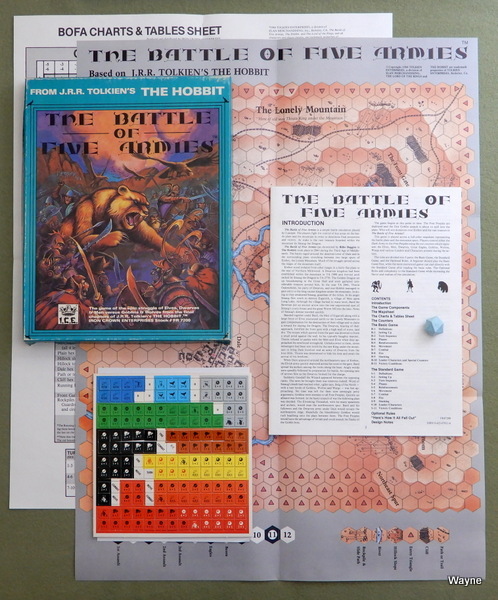 The Fellowship of the Ring is a two player game based upon J.R.R. Tolkien's three volume epic, The Lord of the Rings. Action focuses on the eraly periods as the Fellowship attempts to move the Ring from the Shire to the vicinity of Mordor. One player controls the forces of Sauron, the Dark Lord; while the other player controls the Fellowship characters and their allies. The game uses special cards and plastic markers to implement deployment and hidden movement. The cards and markers even allow certain combats to be resolved without revealing the identities of the combatants. The Fellowship player attempts to avoid, deceive, and misdirect the Enemy player while moving towards Mordor. The Enemy player attempts to force the Fellowship player into combat where the Ring can be retrieved for its rightful master, Sauron of Mordor. The rules are organized for a standard scenario and basic game; however optional rules are included for simpler and advanced games." "This action packed game simulates the epic struggle from the final chapters of THE HOBBIT™. Elves, Men, Dwarves and Great Eagles do battle with Ores, Wolves and Wargs for control of Lonely Mountain and the vast treasure. As the Free Peoples player you control the hastily allied armies defending the mountain spurs and the Front Gate, entrance to the ancient Dwarven Kingdom. Your numbers are few but among them are some of the best warriors known to Middle-earth. As the Dark player you command Bolg of the North and his vast host. The weight of numbers is with you as is the element of surprise. The second wave of goblins comes scrambling over Mount Erebor itself. Who will win dominion over the mountain in THE BATTLE OF FIVE ARMIES? 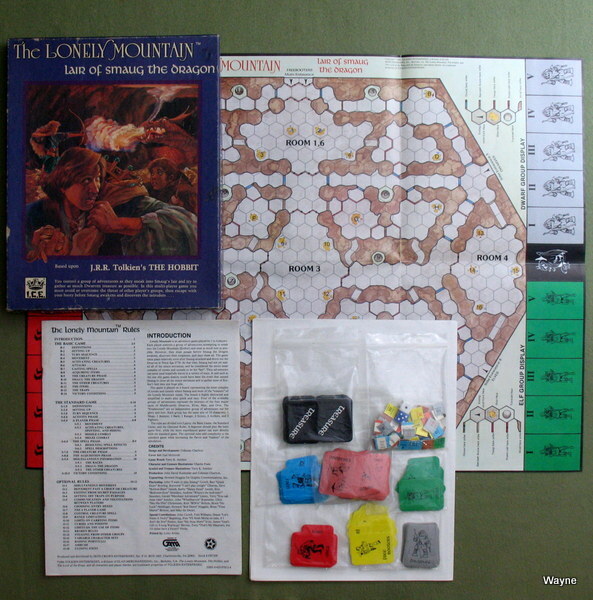 This game is played by 2 people across a beautiful full-color map of the mountain spurs and battle plain between. The object is to win the day by gaining control of key areas. A set of Basic Rules provide the simplicity and guidance necessary for beginning players. The Standard Rules provide a complete, fast paced game for experienced gamers as well as beginners who have mastered the Basic Game. Finally, the optional rules add complexity to the Standard Game while increasing the flavor and 'realism' of the simulation." "Lonely Mountain is an adventure game played by 1 to 6 players. Each player controls a group of adventurers attempting to sneak into the Lonely Mountain (Erebor) and steal as much loot as possible. However, they must escape before Smaug the Dragon awakens, discovers their trespasses, and slays them all. The game takes place relatively soon after Smaug attacked and drove out the Dwarves in Third Age 2770. At that time, Smaug had not yet sealed all of the minor entrances, and he considered the entire inner complex of rooms and tunnels to be his "lair". Thus adventurers can enter (and hopefully leave) in a variety of ways. 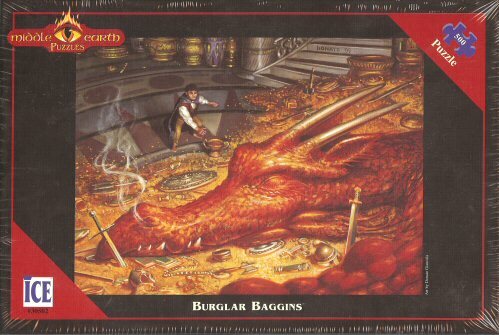 A raid such as the one this game depicts could have been the event that caused Smaug to close all the minor entrances and to gather most of Erebor´s loot into one huge pile." - One full-colored, mounted, puzzle-cut board (6 pieces). - One set of Basic Rules (8 pages). - One set of Advanced/Optional Rules (4 pages). - Eight plastic playing pieces (markers). "Middle-earth is the setting of J.R.R. Tolkien's master works of fantasy: The Hobbit, The Fellowship of the Ring, The Two Towers, The Return of the King, and others. 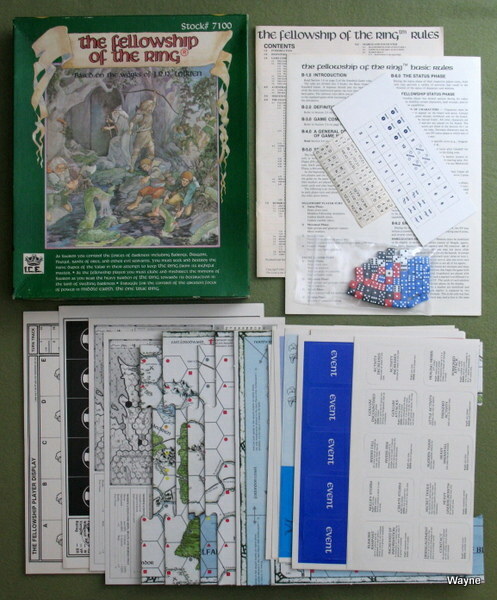 Riddle of the Ring is a game which recreates much of the action in his famous trilogy, The Lord of the Rings. Players will enjoy many of the same adventures experienced by the original characters. 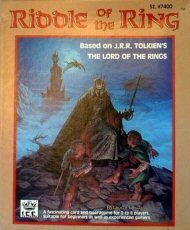 Players do not have to be familiar with Tolkien's works or Middle-earth in order to play and enjoy Riddle of the Ring..."
"This Handbook and its supplements will contain complete information on all currently available Middle-earth miniatures. Each miniature is described and photographed individually in its entirety. 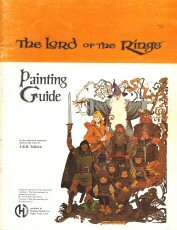 In addition there is a guide to the costume and weaponry of the races of Middle-earth, invaluable to painters and collectors alike, with extensive text, and over sixty maps and line drawings."